Nike Basketball has returned to New York City for another summer tournament that will feature games between the sneaker company’s handpicked squads and the top streetball players from the Bronx, Brooklyn, Queens and Harlem. 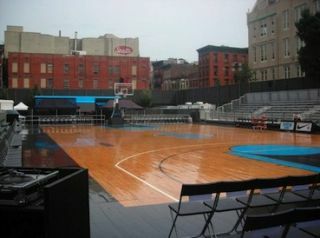 The tournament is taking place at a temporary location, dubbed Rivington Court, in a schoolyard on Manhattan’s Lower East Side, which features a shellacked hardwood floor, two sets of bleachers plus courtside VIP seating, an electronic scoreboard, large LED screen and a QSC K Series Loudspeaker System. Visual Word Systems, a rental and sales company that also stages corporate events, supplied and installed the audio-visual package for the summer tournament, including eight QSC K12 two-way, 12-inch active loudspeakers and a pair of QSC KSub dual 12-inch active subwoofers, with environmental covers to protect against the elements. A PreSonus StudioLive digital audio console and a selection of Shure XL4D (UHF Diversity) microphones complete the audio system. According to Ike Eckstein, president, Visual Word Systems, because Rivington Court is surrounded on three sides by apartment buildings, organizers set a sound pressure level limit of 60 dB maximum, and 80 dB on the court. “We put four K12 speakers on each side. We used ratchet straps to attach speaker stands to the top of the bleachers, extended the stands for extra height, and angled the K12s down,” said Eckstein, who has been in business for 31 years. The start of the summer-long tournament, which includes Team Nike I vs. Team Nike II, a Battle of the Boroughs and dunk contests, coincided with the launch of a new Nike Hyperdunk shoe that LeBron James will wear with Team USA at the London Olympics. The shoe houses sensors and an accelerometer with Bluetooth connectivity that allows users to download data into a smartphone and compare their jumping and running statistics against other players and the online community. At the start of the tournament, Nike used the area for training and brought in local area retailers for sales training for the new sneaker, and additionally hosted a media day following the opening game in late June. “This was a challenging event, and the audio was the simplest part of the event to accomplish,” Eckstein said.